What to make of Raúl's recent declarations? Or, how are "normal" relations different from "diplomatic" ones? 1. La eliminación del embargo. 3. El cese de las trasmisiones radiales y televisivas (Radio TV Martí) hacia el territorio cubano. 4. La compensación al pueblo cubano los daños humanos y económicos sufridos como resultado de la política estadounidense. 3) Is he simply looking for a new series of excuses to prevent real detente and maintain his tried and true enemy as an enemy? *The nitty-gritty of full diplomatic relations -- raising the flags over embassies, naming ambassadors, etc. -- is being negotiated. *But beyond that, both governments are noting other issues (financial claims, the Guantanamo base, TV & Radio Martí, the embargo itself, etc.) that need to be resolved if they are to consider that relations have been "normalized". *In other words: "normalized" relations are not equivalent to "diplomatic" relations and neither side is saying that the second is contingent on the first. In sum, establishing diplomatic relations will be relatively quick and painless, while full "normailization" will take time (years, most likely) and involve painful and controversial decisions on both sides. 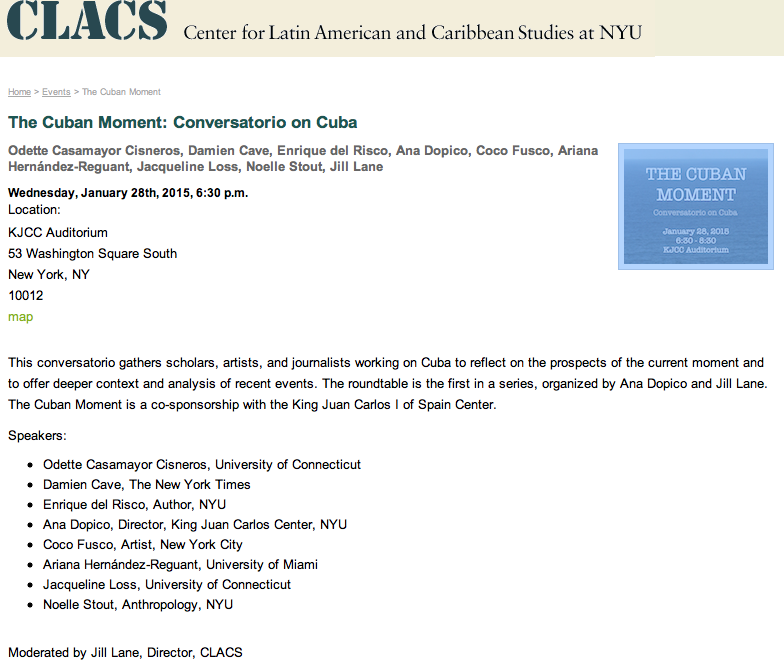 I went to an excellent academic panel on "The Cuban Moment" tonight at NYU's Center for Latin American and Caribbean Studies. Like good academicians they (along with the token journalist, Damien Cave of the NYT) were very critical-minded and quite skeptical that any real or positive "change" would come from the Obama-Castro détente. At the same time, I found myself increasingly frustrated because presumably all of the panelists also thought on December 16 that previous US policy was ineffective, wrongheaded, and even counterproductive - both for the Cuban people and for US interests. I agree that there's a lot to be cautious and even skeptical about - both in terms of the US's real motives behind the new policy ($, security & stability, or democracy & human rights?) and regarding the extent the GOC will allow any changes to take place that might undermine its internal power and control (ie, in telecom or trade with the private sector). One take away is that no one should expect positive changes in Cuba or a solution to the Cuban crisis to come from the United States. But is anyone promising that or even saying that it's the goal of the new policy? Solutions to Cuban problems have to come from Cubans, and especially the interplay between a very powerful state apparatus, weak economy, fractured yet dynamic civil society, and everyday citizens. Still, I must ask the panelists (and you my readers): What is right/positive about the new policy, what is flawed, negative, or naive, and what would YOU do differently if you were Obama (or even Raul)? 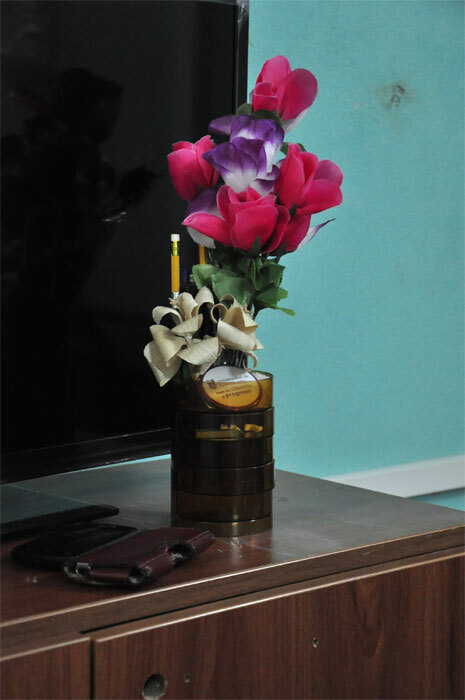 From External Embargo to Internal Blockade: El Yuma is Back on the Blog & Back at Books & Books! Needless to say, a lot of water has passed under the #Cuba bridge since I last updated my blog in August, 2014. If you've been following me on Twitter or Facebook, you'll know that I had (and still have) a very good excuse for giving the blog a rest over the past 5 months: Dimitrios Jackson Henken is his name and he arrived into our lives on October 9, 2014, giving me the best birthday present I could have ever wished for! (I turned 43 just two days before he was born). Happiness is a warm son! Bang bang, shoot shoot. After becoming an expert at changing diapers and singing "De Colores" to my young son during October, November, and December (...y por eso los grandes amores de muchos colores me gustan a mi, y por eso los grandes amores de muchos colores le gustan a Dimitri...), I spent a good portion of the second half of December and all of January deploying my dormant Cuba expertise. You can see some of my comments in The New York Times and the NYT's Op-Talk Blog, The Wall Street Journal, AP, CNBC, CNN, the NPR shows All Things Considered and On Point (where I shared the mic with USA Today's Alan Gómez, Cuban blogger and journalism professor Elaine Díaz, and director of the Institute for Cuban and Cuban American Studies at the University of Miami Jaime Suchlicki), and Diario de Cuba (where I discuss the Cuban Internet en español with José Remón, Larry Press, Iván Darias, and Ubaldo Huerta). You can also check out Time Magazine, the Los Angeles Times, France 24, Australia's ABC radio show The World Today, China Central TV's World Insight show (with professors Rafael Hernández of Temas in Havana and Sun Hongbo from the Institute of Latin America, Beijing), USA Today, Al Jazeera-America, Arise America, McClatchy (on paladares! ), The Miami Herald & El Nuevo Herald, Martí Noticias, and on María Elvira's Miami TV show (part 1 and part 2). Arch Ritter and I have also been busy publishing a handfull of overlapping op-eds related to our new book, Entrepreneurial Cuba: The Changing Policy Landscape (50% off offer here). First, we published, "Abajo con el bloqueo en contra de los emprendedores cubanos," in 14ymedio on December 13. Later, following the historic December 17 Obama-Castro joint announcement to reestablish diplomatic relations after almost 54 years, we expanded on that by publishing updated reflections in New York City's El Diario, The Huffington Post's ongoing 90 Miles feature (the entire January series is highly recommended), and in a forthcoming article in the February issue of the foreign affairs journal Current History (a version of which is included below). 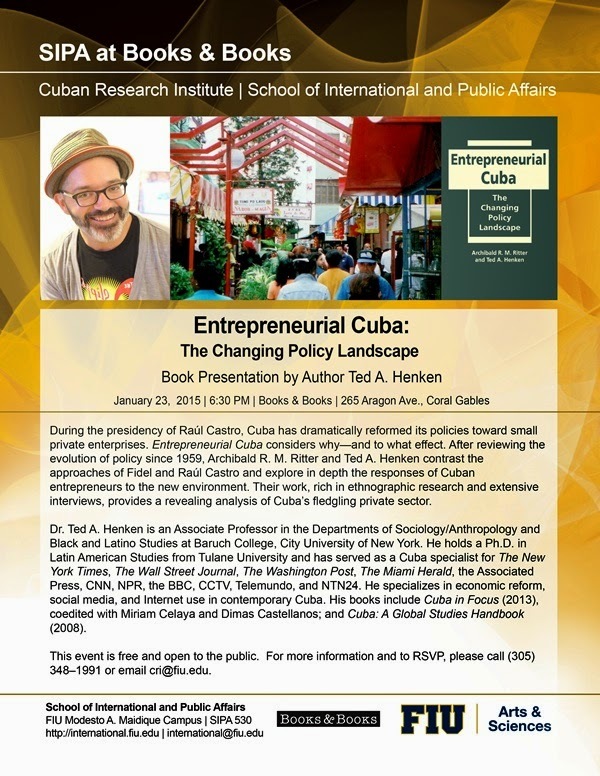 After a restful and sunny January spent on Miami Beach with my growing family, last Friday evening, January 23, I was proud to present our book at the Coral Gables cultural institution, Books and Books, with the generous cosponsorship of Florida International University's Cuban Research Institute and its director Jorge Duany, who kindly introduced me (the Livestream podcast of the event is imbedded below and starts at minute 5:15). A big thanx to the 75-100 full house of people who attended (even those who came early to see me when they were really interested in hearing Marius Jovaisa present his new book of arial photography, Unseen Cuba). Special thanks are due to the honored guests Dimitri Jackson, his mom Tasha, and Abuelita María; Sandra Ramos & family; Eduardo Suñol & Nancy Regal; as well as to Amparo Pujol, Jorge Sanguinetty, Nicholas Sánchez, Juan Juan Almeida, Ernesto Hernández Busto, and former Czech Ambassador Martin Palous, good friends and colleagues, one and all! For frozen East Coast, tri-state residents who could not escape to Miami for the event, Arch and I will present our book together on Thursday evening, April 2, 2015, at the Americas Society. Details to follow. Are Raúl’s Reforms Change Cubans Can Believe In? “El ojo del amo engorda el caballo” (The eye of the owner fattens the horse) and “El que tenga tienda que la atienda, o si no que la venda” (Whoever has a store should tend to it, and if not then sell it”).